The United Nations’ Food and Agriculture Organisation estimates that in Malaysia, the amount of food wasted is about 15,000 tonnes per year and for scale, the Petronas Twin Towers can be filled up in just 18 days with these foods gone to waste. Food wastage is a major concern as it emits greenhouse gasses such as methane, which contributes to global warming. Taking note of the severity of this issue, AEON hopes to combat food wastage by launching the AEON Community Food Share programme. The AEON Community Food Share Programme is organised in line with the Ministry of Domestic Trade and Consumer Affairs’ call to reduce wastage, as well as to share food and resources with the underprivileged communities on a daily basis. To achieve this, AEON CO. (M) BHD. has teamed up with the Kechara Soup Kitchen to distribute a healthy amount of food to selected homes and soup kitchens daily. It will kickstart in AEON Cheras Selatan and from there, extend to all AEON Malls and Stores across the country. Officiated by Y.B. Dato’ Saifuddin Nasution Ismail, Minister of Domestic Trade and Consumer Affairs; Selangor Princess Yang Amat Mulia Tengku Datin Paduka Setia Zatashah binti Sultan Sharafuddin Idris Shah who is a regular volunteer at the Kechara Food Kitchen with her very own waste reduction campaign called #zerofoodwastage; and Shinobu Washizawa, Managing Director of AEON CO. (M) BHD. 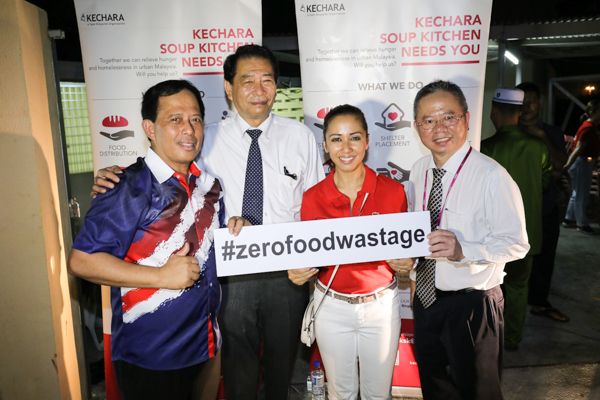 The launch event consisted of unsold consumable foods from AEON Cheras Selatan being prepared and delivered to various welfare homes in close proximity to the mall.